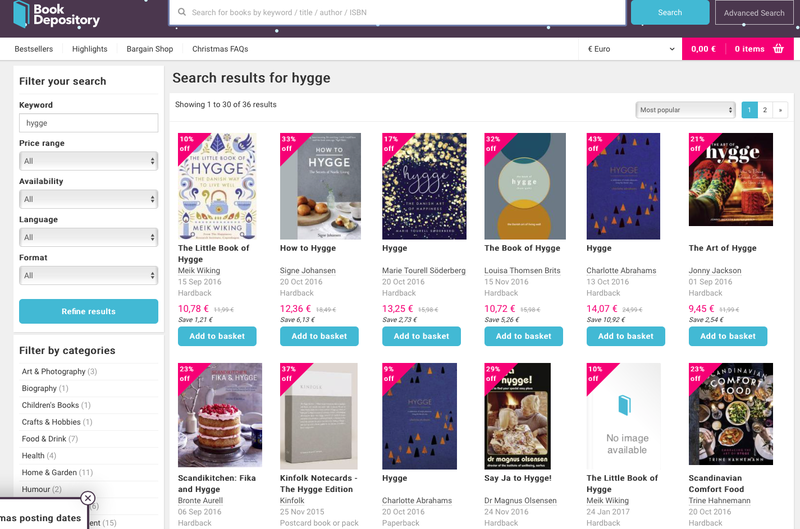 Do any book shopping (either online or in a bricks and mortar shop) in the run up to Christmas and you are bound to come across a host of books with the Danish word ‘hygge’ in the title. The reason for this sudden explosion was explained last week in a fascinating Guardian Long Read piece by its culture editor, Charlotte Higgins. Hygge has not arrived in our midst by accident. Its sudden presence in Britain is a matter of deliberate inducement and persuasion. In its most visible manifestation – the onslaught of books on the subject – it is a trend that has been carefully concocted in the laboratory of London publishing houses, and then disseminated through the ready collaboration of an enthusiastic neophile press. It is book editors – largely young, female and bright – who created the formula of hygge for a mass British audience. The starting point for these young lifestyle alchemists was an article that appeared on the BBC website in the first autumnal days of October 2015. There have been many instances down the years of publishers picking up popular tastes and creating a market for books on the subject. (A similar plethora of books based on the success of the Country Diary of an Edwardian Lady in 1977 springs to mind as an example from four decades ago.) But what makes this interesting is the commissioning process that Robertson reveals. After the hours spent ‘flicking round’ websites, she and the other editors had to find writers: but this was ‘not a straightforward exercise’. 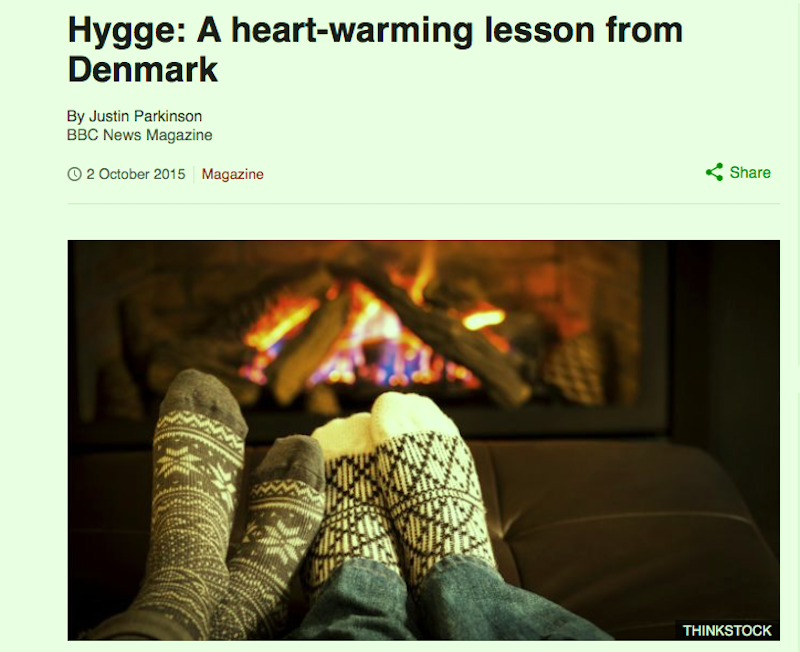 Higgins writes: ‘the notion of hygge is so taken for granted in Danish language and culture that there was no readymade cohort of authors or experts to call on. The editors had to either track down a willing Dane, or identify someone with tangentially related knowledge.’ So authors ranging from professional writers, political scientists and (inevitably) actors who had appeared in BBC4 drama series were contracted. The resulting books will now be piled up in your local bookshop ready for the Christmas rush. They will all have covers featuring either warm socks, log fires or home baked buns — or perhaps all three. Most will sell quite well, and one or two may be outright best sellers, because that is the way in which modern publishing works, especially in a post-Brexit, pre-Trump world which is increasingly un-hyggelig. But it is precisely this sense that it is beyond politics – as well as its ubiquitous, irreducible Danishness (and thus not-foreignness) – that allows it to be mobilised by politicians, particularly those of the xenophobic far right, who have become a rising force in Danish politics over the past decade. Kjærsgaard, who is now the speaker in Denmark’s parliament, gave an interview last year in which she described, in detail, the importance of making her office hyggelig – with family photos, lamps, porcelain and knick-knacks. “I cannot thrive and work in offices that aren’t hyggelig,” she said.